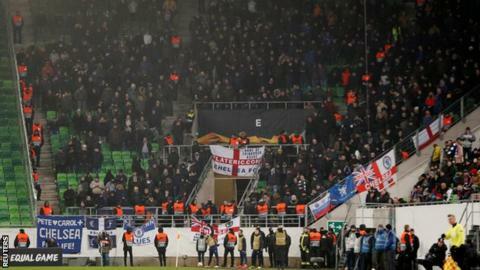 The club have also condemned fans who sang an anti-Semitic chant during last week’s Europa League tie with MOL Vidi. Buck said the actions were “unacceptable” and “unwelcome”. “A deeply unpleasant but vocal minority which refuses to join us in the 21st century has shamed the great majority of our decent, well-behaved fans,” he added. Last week, Chelsea suspended four fans from matches while the investigation into the alleged racial abuse of Sterling takes place. Buck greeted Blues fans at the turnstiles before Sunday’s Premier League win at Brighton, and in his letter said the club would “beat the plague that threatens to overshadow the fantastic work this club does for inclusion and equality”. “Clearly, there remains a way to go on this journey, but we will not rest until we have eliminated all forms of discrimination from our club,” Buck said. “We will continue to work alongside our fans, anti-discrimination organisations and football authorities to create an environment where everyone feels welcome and valued. If you do not share these values, this is not the club for you. “We must not allow a small minority of fans to bring further embarrassment upon us, and will continue to take the strongest possible action against them. Read Buck’s full letter here.